Last night there were no less than five football games on my cable package, including a multitude of college games that counted. The gloriousness of having the greatest sport on the planet, back in its full glory....well, I have to admit I was a bit giddy. OK, sure it was dampened by the fact that the Redskins haven't crossed the goal line the past two games and the Titans first-team offense hasn't been in the end zone all this pre-season, but you know, it was football being played with a vast selection of games. It's all just a warm-up for the BIG game Monday night as the Vols travel to the West Coast to take on UCLA. "We just need some points"
While commenting on Kathy's post, a thought struck me. Usually, part of this whole song and dance (which it always the same) is that it's some kind of contest against another team, who apparently should have been by before now, but thankfully for this person hasn't darkened my door. (Is it wrong at this point that I wish I had a dog if only for the intimidating barking factor?) And more often than not, it's a guy or a couple of guys who say it's some kind of battle of the sexes and they just want to beat out the team of girls, who are also canvassing the neighborhood. So, here's what I realized. In all the times I've run across the "points" sellers, I have yet to a)hear from more than one team in a day and b)find a team or group out that has any female representation. Kind of makes you wonder, doesn't it. Are there other teams out there, bothering other neighbors? And if there are, are there any female "points" sellers? Or are they just a mythical creation like Bigfoot? I wonder if "Mythbusters" would do an episode about it? Waiting for the elevator yesterday, I noticed a fellow elevator rider engrossed in one of the paperback installments of the “Twilight” series. After not giving into the temptation to offer my unsolicited opinion of the series, I observed that she was very intent on the book. Or to put it another way, she was really, really into the book. So much so that when the elevator arrived, she only glanced up to see which one it was and then proceeded to walk into the elevator, while reading. She then proceeded to ride down, fully immersed in the book the entire time. Once we got to the stopping point, we moved out and I noticed that she kept reading and walking along for a long period of time–probably far longer than I ever could have both walked and kept my nose buried in a book. It struck me as slightly amusing because while I love to read, I’ve never been one to read while you walk. I guess part of it is a fear I’d walk into something, but another part is I like to have some bit of concentration while I read. Yes, I do read while I’m using the stationary equipment at the gym, but the odds of some unexpected hazard (such as say a person, animal or car) are far less there than say, walking out of an office and on the street. I will admit there have been and are books that have grasped my attention, making me eager to read what happens next. But the most harm I’ve been able to cause myself there is losing sleep or being late getting somewhere becuase I felt I just had to get through one more chapter or the next few pages. Most Friday mornings after I'm done with my job responsibilities, I'm able to make it to the Y in time for a spin class. As some of you know, I enjoy spinning and swimming as my two main forms of exercise in my never-ending quest to train for desert. Most Fridays, there is an older couple of comes to the Y at the same time. He comes to class and she's in a wheelchair, that he places so she can see him and vice versa, as well as look out on the rest of the Y. After the spin class is over, he will go out and you'll see the two of them slowly walking around the track, talking to each other and getting their exercise. This scene plays out on a weekly basis and every time I see it, it seems to me to be a great example of a romantic relationship. I don't know their story so I may be assuming a lot of details here, but I love seeing the two of them have this time together. In a short span of time, I see a couple that is content to be together, but also has their own separate interest and pursuits that each is willing to allow the other to pursue. But, in the end, they always come back together and are a team. I've seen them walking the track and getting into and out of the car and it always just hits me, thinking how sweet it is. Now, I don't know anything really about them. For all I know, they could go home and fight like cats and dogs. But seeing them together, I somehow doubt it. It's this kind of example that reminds me of what it is I'm seeking in this life in terms of a romantic relationship and a partner. And then, I'll get to thinking of how blessed I am to have so many examples of good, solid relationships in my life--from this couple to family to close friends. It also reminds me that things are never perfect, but when you have the right connection with the right person, it's close enough to perfection that all the other stuff really doesn't matter in the long run. No, really, I'm not making that up. Nine-year-old Jericho Scott is a good baseball player -- too good, it turns out. after a game on Aug. 13. Jericho played second base the next game on Aug. 16. So, what's the lesson that we're teaching these young kids? Seems like we're saying that when life gives you things that seem impossible to overcome, that giving up or trying to change the rules is the way to go instead of challenging yourself and working to overcome them. I'm sure Jericho is a very good pitcher but even the best pitchers aren't unhittable. But instead of using this as a chance to teach these kids about the power of working together and never giving up in the face of the odds being stacked against you, they should just give up. You know, I thought playing sports was supposed to teach kids about how to win, how to lose and other life lessons like how to work together to overcome long odds and come out on top. I'm not sure which irritates me more in this story--the league saying that Jericho couldn't play or the other team that just walked off the field and refused to even bother to put forth an effort in playing against Jericho. What kind of message is this sending to the young people of this town? And how long do you think it will before this spreads to other Little League types of sports? Seems the Vanderbilt athletics department made up a catalog full of Vandy stuff for their fans to buy and wear with pride. Sent this out to all the season ticket holders, only for the season ticket holders to discover that the guys holding up football helmets in one of the cover picture are...wait for it...Georgia Tech players. Tish's post about meeting a service dog a couple of days ago, reminded me of an amsuing story from my days in college. I can't recall the name of the class I was taking, but it was taught by two professors. One of the two was legally blind and had a service dog who helped him around. On the first day of class, he got up and told us this and then went over the commonly asked questions about the dog. First of all, we weren't allowed to pet the dog or give her any treats. She'd had a lot of training to convince her that she enjoyed working and helping him out, but he knew it wouldn't take much to convince her that there was a whole other lifestyle out there other than leading him around. He also went on to tell us that we could call her "Fang" which wasn't her real name. He wouldn't reveal her real name to us because, as he put it, "what if I'm out crossing Cumberland Avenue (the world-famous Strip for those of you not familiar with UT) and you call out 'Hey Fang!' as you drive by me. And Fang stops to look up and around for you and there I am stuck in traffic in the middle of the Cumberland Avenue and my whole life flashing before my eyes. And since I'm blind, there wouldn't really be much to see!" Visiting my old church in Knoxville and seeing old friends. Sharing lunch with my best friends and catching up on each other's lives. Handbell practice has started again. I don't have confidence in my singing, so having this way to make a joyful noise and offer praise and worship that way is always wonderful. I enjoyed the few months off to rest and recharge, but I'm excited to be starting back again. Books coming in on reserve at the library. I know, it's kind of silly, but I love to read and there's just something cool about that book you've been anticipating coming in and going over to pick it up. Yes, I'm a book geek. I know it. 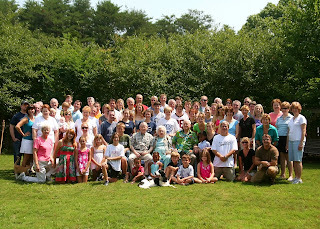 At my recent family reunion, we had a group (well, those who were there) photo made. Looking at the picture now you can't tell we were hot, hungry and getting restless, imploring the photographer to "please take the picture so we can get out of the heat, already!" My great-aunt and great-uncle who celebrated their 60th wedding anniversary are in the center. I'm just so proud and happy to be part of this great family. Sometimes it's the little things in life that make me happy. Such as fresh, homemade chocolate chip cookies. I got to have some tonight and man they were good. Right after I had a BLT with fresh tomatoes. Before we had the Internet, how did we ever go, "I wonder what happened to _____" and then find out? I've lost track of a several friends over the years, often wondering at times what they were up to, where life had taken them and how they were doing now. Thanks to the Internet and a couple of the social networking sites, I've been able to get back in contact with some old friends the past few weeks and months and find out. And it's been a real treat to get to do so. Of course, the other good thing about them is that it helps you keep up with new friends and family as well. Sure, it shouldn't ever take the place of having real world social interaction, but it's still nice to be able to quickly and easily keep up with old friends, new friends and family via the Internet these days. The Titans' return to the field for a pre-season game and looked really good on both offense and defense. It's just too bad they couldn't have played the Rams like this a decade ago in the Super Bowl. Maybe we'll get a chance to win a Super Bowl this year. Maybe it will be my dream Super Bowl of Redskins vs. Titans. It's been a little over a year since The Rick and Bubba Show came back to the airwaves in Nashville. And the show still continues to make me smile on a daily basis. And to think and sometimes it'll even make you cry. I look forward to listening each morning. It's one of life's simple pleasures. And one that makes me happy. Back in the day when the Redskins were the best team in the NFC (the 80's and early 90's) one of the fixtures of the team was wide-receiver Art Monk. The fact that it took so long after he retired for Monk to get in the Hall of Fame is a joke and a travesty. But to see him get into the Hall of Fame this past weekend was a big thrill for me. One of my favorite players getting the accolades he so richly deserved. It made me smile. And it didn't hurt that another Redskin great of that era, Darryl Green, also got in as well. He got in on the first ballot...as Art Monk should have. I visited my old Knoxville church home last Sunday morning. It's always wonderful to walk in, see familiar faces and catch up with old friends for a few minutes. But another part of my visit that makes me happy is that every time I go, I see new, fresh faces there as well. It's nice to see that while many things stay familiar, there is also change and growth going on at the church. It's wonderful to see a church family that was very important to me during the time of my walk with them, continuing to have an impact for the kingdom on the community of Knoxville and the world. These conversations were had with a younger cousin at my family reunion this past weekend. She: Girls are better than boys at ping-pong. She: I beat three grown men at ping-pong. She: See, I told you girls were better than boys at ping-pong. She: I know you, you're Michael. She: No one. We all just know. She: Then what are you? It's good to know the rest of the sports universe is taking time off so the Brett Favre situation can unfold in Green Bay. Did we really need to cut away from the pre-season game last night to see footage of Brett emerging from his private plane in Green Bay? At this point, I kind of expected Super-Favre to fly there himself, his number four jersey flapping behind him like some kind of weird cape. It's sad when SportsCenter devotes ten minutes to this story and then two seconds to highlights of the pre-season game taking place, much less the news that Art Monk finally made it into the Hall of Fame. You know, I'm all for the kids reading and everything, but if I have to hear any more about the new Twilight book that came out, I may scream. Don't get me wrong--Stephenie Meyer is a talented author who has a bright future ahead of her and I'm all for anything that gets the kids to be excited about reading these days. That said, I wish the books being hyped were, well, better than they are. I've read the first three and beyond the first two-thirds of the first was totally underwhelmed. Maybe it's because I'm not a teenage girl, but I just don't see what all the excitement it about. I think part of it is that in the last two books I read, the main character Bella became so self-absorbed and petulant that I just wanted to toss the book aside in frustration. It left me with no desire to pick up the next novel though I will try and find out how the storyline ends to see if my feelings and predictions are true. This weekend was my annual family reunion, which is always a highlight of the year for me. It's just nice to get to spend time catching up with family, enjoying each other's company and eating lots and lots of really good food. This year's celebration was made even more special in the kick-off Friday evening. My great aunt and uncle are celebrating their 60th wedding anniversary this year. And Friday evening we got to have a time of celebration with them. I'm proud and honored to have been a part of it. And also to see their example to our family of a strong, solid Christian marriage. And to look around at the many members of my family there who are married as well. We also celebrated their grandson's marriage and looking around at the rest of my family, I see many examples of long, solid marriages built on friendship, love and putting the right things first. It's humbling, it's inspiring and it's something that makes me very happy and blessed to be a part of it. Pre-season football begins this evening with a battle between the Redskins and the Colts. I realize that the starters may only play one play, but who cares...it's pre-season football between two of my favorite teams. UT begins fall football practice this morning. The greatest sport ever invented is getting closer. Can you feel the excitement? Another thing that makes me happy--the fact that the Vols will have a good shot to knock off the number one team in the country, should things remain the way they are. Georgia is number one in one poll and given the fact that they couldn't beat Tennessee the last two years and they're 4-6 against the SEC East in the past two seasons, I think the Vols have a great chance to, once again, deny them a shot at a national title. Of course, right now everyone is undefeated and in the race for the national title...well, except maybe Vanderbilt. Last night was the final concert in the Bluegrass Nights at the Ryman series and while I'm sad they're over, I thoroughly enjoyed this year's series. Enjoying the great shows with my parents was nice and I look forward to them again next year.